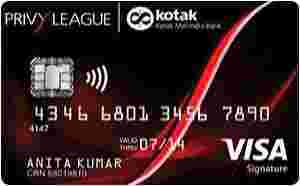 Kotak Bank Privy League Visa Signature is typically available to those with good credit scores (650 or greater). - Earn 10000 points on achieving Rs. 4 Lakhs spending milestone and another 20000 points on achieving Rs. 8 Lakhs. - 1% fuel surcharge waived off on every transaction of Rs. 400 - Rs. 4,000 (A maximum surcharge waiver of Rs. 4500 per calendar year). Mainly this card focuses on very high-income customers and Privy League Insignia and Optima Bank account-holders in particular. With its high initial cost, you can go for free variant and enjoy similar benefits, as provided. You can look for other priority banking cards like Standard Chartered Priority Visa Infinite credit card which is free of cost and has numerous benefits to serve you better.